Microscan releases the LVS-9585 Handheld Portable Barcode Verifier, providing verification of both printed labels and direct part marks (DPM). The new LVS-9585 ensures the readability, quality, and data integrity of 1D and 2D printed labels and direct part marks to internationally accepted standards including GS1, ISO 15415/15416, ISO/IEC 29158 TR, and MIL-STD-130N. The new LVS-9585 handheld barcode verifier ensures 100% quality and readability of printed labels and Direct Part Marks (DPM) throughout the entire supply chain - preventing business from fines and production errors. 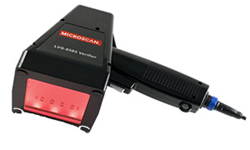 Microscan, a global manufacturer of barcode readers, verifiers, and machine vision inspection systems for traceability and quality control in industrial manufacturing, announces that it has released the LVS-9585 Handheld Portable Barcode Verifier, providing verification of both printed labels and direct part marks (DPM). 1D and 2D direct part marks are created using methods such as laser etching, chemical etching, and dot peen marking on a variety of surfaces including metals, plastics, ceramics, and composite materials. They provide a rugged and permanent mark that enables product identification in applications ranging from medical devices to electronic components, as well as automotive, aerospace, and military hardware. To ensure that a part can be accurately and consistently read with a barcode scanner over its operating life, it is critical that the initially applied mark meets minimum readability requirements. The new LVS-9585 verifies the readability, quality, and data integrity of 1D and 2D printed labels and direct part marks to internationally accepted standards including GS1, ISO 15415/15416, ISO/IEC 29158 TR, and MIL-STD-130N. Microscan’s GS1 certification provides the assurance that the LVS-95XX-series verifiers can help users comply with the U.S. FDA’s Unique Device Identification (UDI) requirements for medical device labels. The powerful PC-based analysis software allows users to see important pass/fail data and to identify potential problems before they compromise reliable identification of product barcodes. The large field of view allows verification of larger marks. A mounting stand accessory allows large parts with direct part marks to be positioned efficiently for fast verification. For Direct Part Mark (DPM) applications, the software automatically finds the symbol, cycles through red dome, white dome, and 30-degree angle lighting, selecting the optimal lighting for the material substrate and marking method that are used. The user can then select the optimal lighting for a given part, further optimizing the verification process. Printed reports and a verification testing data archive featuring both .csv data export and an SQL database interface provide data integration with a user’s quality monitoring system. To request for additional information on LVS-9585, click here. Microscan is a global leader in barcode reading, machine vision, and verification technology serving a wide range of automation and OEM applications. Founded in 1982, Microscan has a strong history of technology innovation that includes the invention of the first laser diode barcode scanner and the 2D symbology, Data Matrix. Today, Microscan remains a leader in automatic identification and inspection with extensive solutions ranging from barcode reading, tracking, and traceability to complex machine vision measurement, guidance, barcode verification, and print quality grading. As an ISO 9001:2008 certified company recognized for quality leadership in the U.S., Microscan is known and trusted by customers worldwide as a provider of high-quality, high-precision products. Microscan is a part of Spectris plc, the productivity-enhancing instrumentation and controls company.